Chronic diseases-heart disease, diabetes, lung disease, and common cancers-claim more than one out of every two lives worldwide. Within the next few decades their toll will rise, most greatly in developing countries. Yet this rapid growth of chronic diseases is not being met with a proportionate global response. Left unaddressed, they pose a major threat to social and economic development. This book is the first to synthesize the growing evidence-base surrounding chronic disease, comprehensively addressing the prevention and control of chronic diseases from epidemiologic, economic, prevention/management, and political economy perspectives. Sick Societies is written in five main parts. 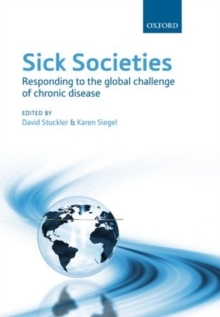 The first three chapters explore the causes and consequences of chronic diseases on a global level. Chapter four identifi es different approaches to preventing and managing chronic diseases, while chapters five and six consider the power and politics in global health that have stymied an effective response to chronic disease. In chapter seven, the themes from the first three parts come into focus through a series of invited contributions fromleading public health experts. The final chapter sets out a model of pragmatic and imaginative solidarity, wherein the struggles of the rich and poor to survive are united by a common cause and shared goals.